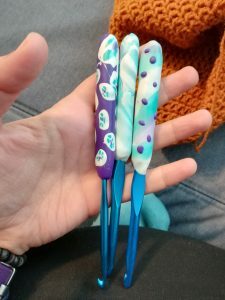 I guess you have seen the polymer clay handle crochet hooks on Etsy? When I first stumbled on one, I thought it was very pretty. Of course, they are expensive for my poor South-European budget, not to mention the outrageous shipping costs and the fact that I will have to lose a day in the customs to get my hook 😀 there are not many hooks sent from within EU.So I decided to make my own! Now, I am not a very artsy person. 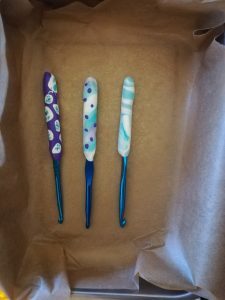 I mean – I love painting with watercolours, but I am really not good at it 😀 So I knew from the start that my clay hooks would not look the same as these from Etsy, but I wanted to try. I am in between jobs currently, so I have some time to do it. 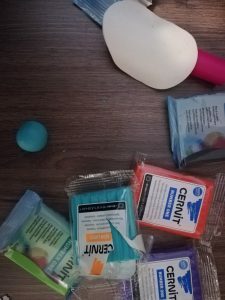 I bought Cernit polymer clay, FIMO was harder to find and did not have so many colors. The first thing I found out was that polymer clay was very hard to work with. 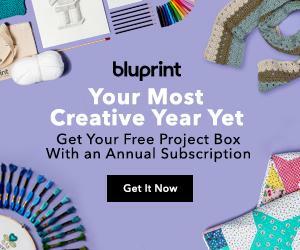 I thought it would be something like play doh. Silly me 😀 Anyway. 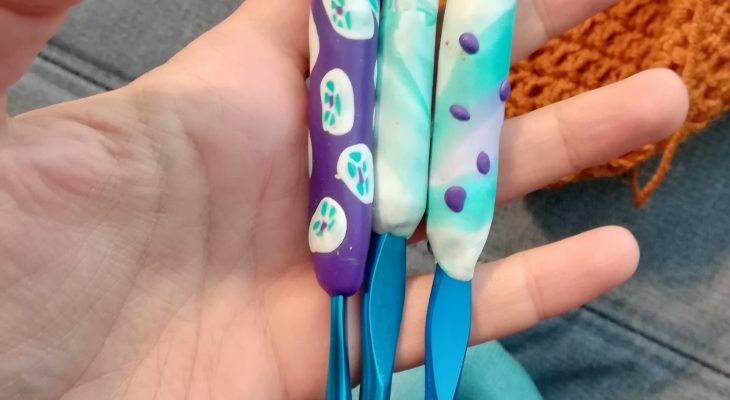 I warmed it while working it with my hands and it gradually became a lot more…responsive :)) I watched a few videos on Youtube on making flower canes and decided that this was the first thing I wanted to try. Apparently, it didn’t work as I expected. But that’s not bad! I learned, I learned a lot! :) First of all, when you make the cane, the clay that you use to wrap should be very, very thin. I did not make it thin and it doesn’t look good at all. Next, you need a very sharp knife or scalpel to cut into the cane so the color clay does not “bleed” into the white clay. So after I saw that the cane is not coming as expected :)) I rolled it over and it produced a beautiful zebra effect! On the label it says to bake 30 mins @ 130 degrees Celsius. I had a bit of trouble with that since my oven works on gas, so even with an oven thermometer, I got it at 130, but then it went up to 150…So I decided to bake them a little less than 30 mins. I baked them for about 20 minutes and they worked fine! So this is the final result. I am pretty happy with that experiment and I will try again for sure! It was a lot of fun!